I am a big video game player and nerd all around. One of my favorite series ever is the Final Fantasy series. Rich in story and memorable moments, you can’t go wrong…except FFX & FFX-2. But another hobby that I did a lot as a kid was model building. Well papercraft is the new generation of model building, cheap and inexpensive. You don’t feel bad if you can’t finish since it’s just a sheet of paper. 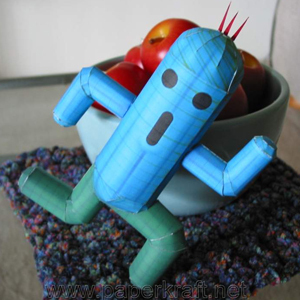 Well at Paperkraft they have made some really cool ones including Cactuars, Moogles, and even Bahamut himself. The guys even delve into anime with an amazing model of Howl’s Moving Castle‘s castle. Now you can 10,000 Needle attack your pets and summon legendary creatures when your parents say that you are failing at life. You can also help make paper doppelgangers that will help in our fight for the people. Get folding at Paperkraft. That is a command from the party. The man above may look like a fruit, but that fruit pulled a brilliant prank. He photoshopped himself into a fake Gucci ad, called a Swiss paper and told them, “Run it full color on Sunday please… Oh and send the bill to Gucci.” Low and behold that when the Swiss called to claim their money, Gucci had no idea what they were talking about and now no one can find the man to pay the $50,000 bill. This isn’t the first time he has done this, also trying to set up a fake concert while posing as Puerto Rican singer Chayanne. It was printed in SonntagsZeitung, that’s Swiss for PW|\|3D!